Traditionally, a fundamental assumption in evaluating the performance of algorithms for sorting and selection has been that comparing any two elements costs one unit (of time, work, etc. ); the goal of an algorithm is to minimize the total cost incurred. However, a body of recent work has attempted to find ways to weaken this assumption – in particular, new algorithms have been given for these basic problems of searching, sorting and selection, when comparisons between different pairs of elements have different associated costs. An O(log n)-competitive algorithm for max-finding on general metrics, and we improve on this result to obtain an O(1)-competitive algorithm for the max-finding problem in constant dimensional spaces. 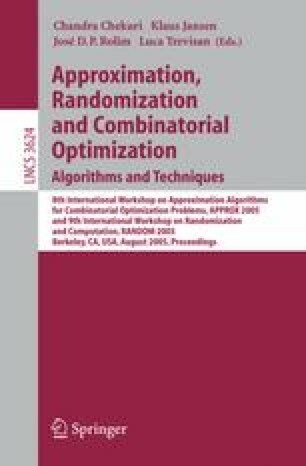 An O(log2 n)-competitive algorithm for sorting in general metric spaces. Our main technique for max-finding is to run two copies of a simple natural online algorithm (that costs too much when run by itself) in parallel. By judiciously exchanging information between the two copies, we can bound the cost incurred by the algorithm; we believe that this technique may have other applications to online algorithms.